Socrates hosts a component of El Museo del Barrio’s 6th biennial of Latino and Latin American art. 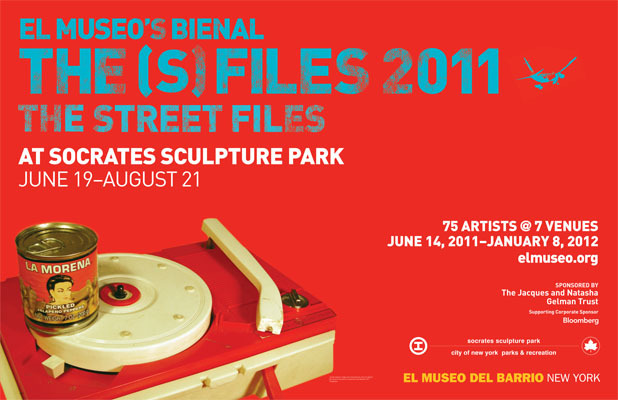 Curated by Rocí­o Aranda-Alvarado, Trinidad Fombella, and Elvis Fuentes, The (S) Files 2011 highlights the most innovative, cutting-edge art being produced by emerging Latino and Latin American artists currently working in the greater New York area. Aiming to expand the definition of contemporary Latino and Latin American art, this year’s edition takes on a broad exploration of the visual energy, events, and aesthetics of the street. Artists featured here explore the landscape as a canvas and bring elements from the street into a conversation with an urban park. Found objects, colored sand, crocheted plastic bags and painted greenery are among the elements used to explore this relationship. For the artists, the city becomes a catalogue and provides an endless supply of images and materials. Sponsored by The Jacques and Natasha Gelman Trust. Supporting corporate sponsor: Bloomberg, The (S) Files Council. Exhibition programs are supported in part by public funds from NYSCA, Department of Cultural Affairs City of New York, WNYC.